This is how you build an off-road icon. 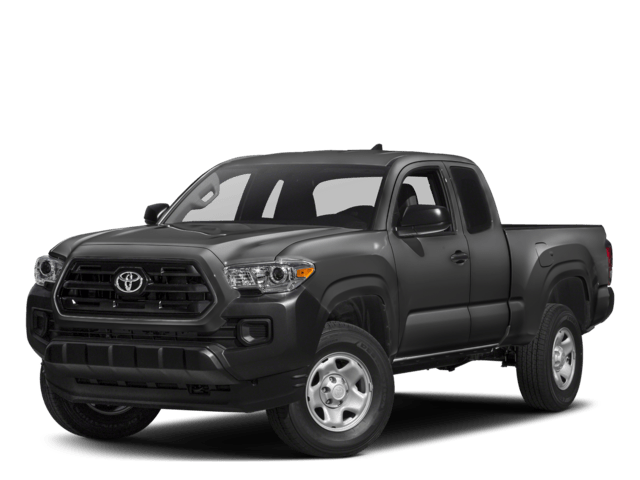 The 2017 Toyota Tacoma is what happens when our engineers take a 50-year legacy of toughness, a whole lot of modern tech, and combine it all into one unstoppable package. And there’s more to this machine than just its aggressive good looks. Advanced off-road technologies and heavy-duty components take this truck to places others fear to tread. A powerful and efficient V6 has got the goods to get you to the end of the map and back. Inside, superior comfort and tech keep you feeling refreshed during those hard-charging expeditions. It’s time to get in touch with your gnarly side. Let’s go places. We appreciate your interest in our inventory, and apologize we do not have model details displaying on the website at this time. Please fill the form out below and our team will quickly respond, or, please call us at (903) 295-9300 for more information. The 2017 Tacoma delivers unwavering capability and the good looks to match. Chiseled character lines and muscular fenders help show off Tacoma’s strength, and an available hood scoop and aggressive grille hint at the power that lies under the hood. It’s attitude amplified, and it shows everyone that this off-road icon is ready to rock. Tacoma’s taillights were inspired by the hardworking C-clamp, and on TRD Off-Road and TRD Sport, they feature smoked-black housings for a bold touch. On Tacoma Limited, the taillights use clear lenses to add just the right amount of sophistication. An available 4.2-in. color Multi-Information Display (MID) helps you keep an eye on the information you want. Customize it to show your mpg, current song selection, individual tire pressure, available Multi-terrain Select setting and more. Let’s bring the outdoors in. Tacoma’s available power moonroof opens up to give you everything from a cool breeze to an epic view of the stars. Keys at the bottom of your gear bag? No problem. When you approach Tacoma with the available Smart Key fob in your pocket (or bag), you can unlock the doors by touching the driver-side door handle and start it up with just the push of a button on the dash. Get ready to capture all the action. Tacoma comes standard with an integrated GoPro so you and your crew can relive all your favorite off-road adventures. GoPro@ camera not included. Considering all the gear you’re loading into your Tacoma, the last thing you need to worry about is finding a cable to charge your smartphone. Good thing Tacoma is available with Qi-compatible wireless smartphone charging. The available Entune™ Audio system lets you access your phone, apps, traffic and weather through its 7-in. touch-screen. Wirelessly stream your favorite playlist and crank it up through the available JBL@ amplifier and premium speakers. And when it’s time to get back to the city, available Integrated Navigation is ready to help show you the way home. When backing up on a trail—or just backing out of your driveway—you need to see what’s behind you. The standard backup camera mounted in Tacoma’s tailgate handle helps you see an image of what the camera detects behind you on the available 7-in. high-resolution display. 1 The Smart Key may interfere with some pacemakers or cardiac defibrillators. If you have one of those medical devices, please talk to your doctor to see if you should deactivate this system. Toyota of Longview	32.530346, -94.773113.